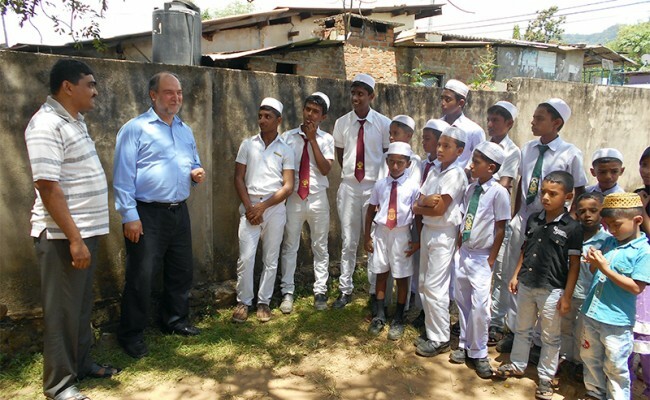 When Zakat Foundation of America (ZF) executive director Halil Demir visited the ZF orphan center in Sri Lanka, the students skipped their summer vacations and stayed up late to greet him. The youngest students, first-graders, shyly introduced themselves in English and sat down. The older students, up to ninth grade, confidently told their stories of hardship and struggle, expressing their gratitude to Allah and ZF for the help they have received. Mr. Demir said that the invitation from the orphan center moved him to travel around the world to see the students. “When I heard that you were waiting for me,” he said, “I flew from far away only to make you happy. If the orphans are happy, Allah and his messenger are happy.” He promised to do whatever he could for them, and exhorted them to work hard and better themselves. In addition to visiting the orphan center, Mr. Demir met and distributed backpacks to children from the Hazaribagh slum area who attend the ZF preschool program. He also visited the ZF Hifzul Quran School where children recited from the Quran, and then visited a plot of donated land that he hopes will be used for another school or orphan center. These children are being educated and prepared for the future through the generosity of ZF donors. Your contribution to Sri Lankan educational and orphan programs can make a difference for generations to come.